Otford lies in the middle of the Darent Valley, within the triangle formed by the M25, M20 and M26 motorways. It is well served by rail, being on the London Victoria to Ashford line, the London Bridge to Sevenoaks line. The local bus service along the Darent Valley is operated by go-coach. All trains from London Victoria and London Blackfriars stop at Otford. You can access the National Rail Journey Planner here. The station code for Otford is OTF. For your return journey, you may find it helpful to look at the Live Departure Boards for Otford to check the time of your train. The main station exit is from Platform 1. Turn right out of the building , walk to Station Road and turn left, downhill. Otford Pond is about four minutes walk. Please take care on the narrow pavement. The local bus company is go-coach. Their service 421 runs between Swanley and Sevenoak. Click here for the timetables. We are hoping to put arrangements in place for bicycle hire at a number of locations in the Darent Valley. Watch this page for updates. 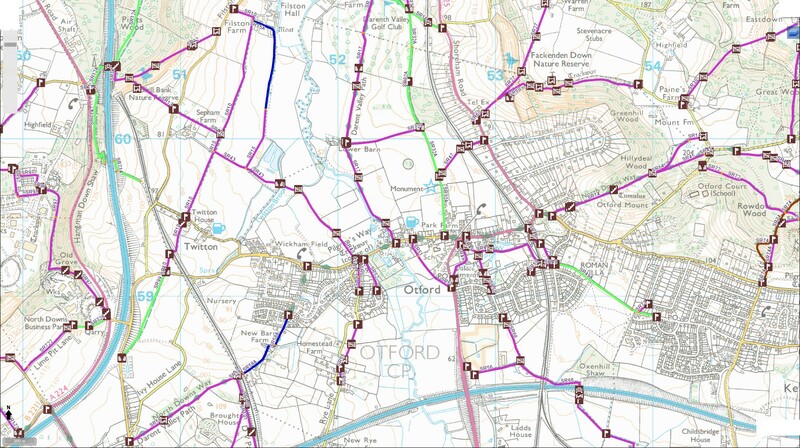 The footpath map can be accessed by clicking here.